A Selector is a short expression that allows your application to easily identify devices; these iizi Selector Expressions are kept in your project’s Selectors folder. Comparable to CSS media queries, your Selectors handle device change, device capability, and much more. You define a Selector and then apply it – in your applications Project view – to either the Module project, a package, or directly to a Panel. Having created your project with Quickstart, several Selectors have been written for you and stored in your project’s Selectors folder. Create a new selector using its wizard. 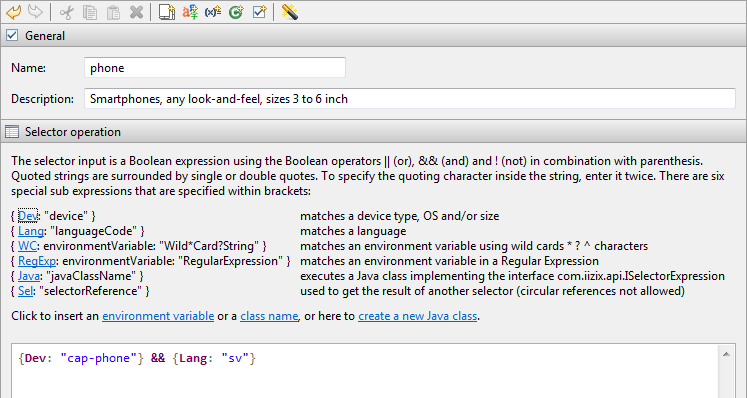 The selector editor is used to define the Boolean Selector Expression.